I want a vintage burn deck with Eidolon of the Great Revels and null rods for the PO match, the burn in the deck (along with the rods) to help the shops match, and the splash from the rest of the deck to hit the blue decks. Possible sideboard cards include ensnaring bridge and blood moon. The Dryad Militant's were originally goblin guides but the interaction was better than the clock. I had been using power, but I'm currently trying without to see if that functions with null rod better.- It doesn't seem to so far. Fork has been really good, Fireblast has been good, (but I only ever want to see one of either). Forked bolt is really great, this deck wants to tap out. There are very few cases that shock is better. The Deck wouldn't exist without Light Up the Stage. I'm throwing this out there, I could use advice and ideas. I know there are a few cards that should be in there. (chalice etc) I don't currently own them online. This doesn't seem so much as a burn deck, more like the monored prison splashing a few burn spells. With that few burn spells (I mean, to count to something like 18 you need 6 burn spells) I'm not sure burn is correct there. Wouldn't it be better to have some creatures with potential to do 4-10 damage per game? BTW, this I'm saying is basically what monored prison is. If you are going to the burn plan, I think you should go focusing on the burn. I thought about fiery confluence (the card is insane), but with that few lands I'm not sure you would be able to rely on that. I think your deck looks way more like a normal red aggro deck running shocks to clear the way to... 6 weak creatures than a burn deck. Maybe you should try using more artifact mana (at least ruby and lotus) to be more explosive, and cut null rod for extra eidolons (they are also PO hate after all). Null rod is only great against PO, it's ok against shops (depending on the hand it's insane, but it's more likely ok), and against the rest of the field they probably would feel good that you are playing this spell. Maybe you could go all in in eidolon effects and get scab-clan berserker too. They are awesome in vintage too. BTW, if you are using burn to the shops matchup, price of progress would be insane. I think LutS is a really good addition to burn in any format. I'd also think Skewer the Critics is an auto-include. You will deal damage every turn, in addition to fetches and phyrexian mana burning the opponent. 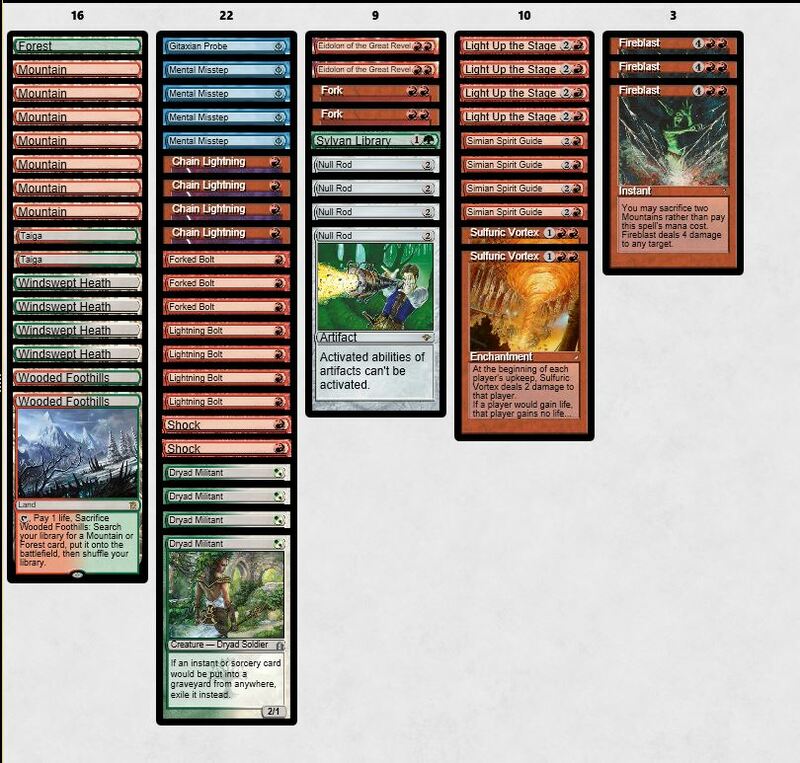 It's basically Lightning bolt 5-8. If you're making this for vintage, than I think any build without bloodmoon is a mistake. BM hits you none at all and just flat out wins vs bazaar dredge and Workshops. If you are running 4x SSG (and I'd go with lotus and on color moxen even if you run 4x rod), you'll get a lot of turn 1 BMs that just own any opponent holding fetches and duals. I dislike sulfuric vortex. 2 damage a turn for 3 mana (that also hits you) is no bargain. Cindervines seems much better in a build like this. It has utility and also is going to do 2+ a turn to an opponent (and only the opponent) much faster and more reliably. Life gain isn't a thing in Vintage - artifacts/enchantments are. Cindervines also removes chalice @ 1, which blocks MANY of your spells. If you are going green, I'd also think atarka's command is decent and tarmogoyf could be huge. I think Dryad could be SB as it is just a 2/1 vs a lot of decks (shops, survival, humans, eldrazi, oath), but it could just be an efficient 2/1. I like swiftspear better here. Anyone have thoughts on Hooting mandrils? Or maybe survial? I tried mandrils last night and they weren't great (not enough to delve them out early on) any idea's what could make that happen more often? Blood Moon is in my side board and is ok. Thanks for the feedback, the burn in the shops match is to hit ballistas and ravagers, hence I don't have PoP. I think you are right that this is more of a controlish list. I may need to go back to the drawing board for this deck idea. I know nothing about the strategic relevancy of Burn in Vintage. However, your fetchlands should be four Wooded Foothills and two Windswept Heath if nothing else changes. They are currently objectively wrong. Maybe try Ub instead of Ug, to let you splash Dark Confidant, Thoughtseize, and possibly Deathrite Shaman? Reminds me of Christmas Beatings from back in the days. A shift in a more disruptive creature suite over strictly burn, could work out better? I think not having access to 4 Chalice of the void hurts in that respect but still worth a try. The question here is: are you doing anything better than monored prison? I don't mean to be mean, but I don't see it being better in any aspect. This is kinda funny actually, you got like null rod and eidolon that are great against PO (seems like it's the baseline for your deck actually, to beat PO), misstep that is good against... blue? fork also for blue decks, burn for shops. But they aren't backbreaking (except against shops). If you want to hit everything, you want to have backbreaking spells against the decks so you compensate the cards that are bad for the matchups. Maybe, just maybe you are looking it at the wrong direction. You want a deck that beats PO, shops, blue, etc. Maybe burn is supposed to be just burn, not a deck to beat those. The deck that should be beaten. To try to impose your gameplan, ignoring as much as possible your opponents'. Make the famous lists of 10 creatures, 16-ish lands, some moxen, blue power (recall, cruise, dig, timewalk) and like 26-30 burn spells. The question here is: are you doing anything better than monored prison? I do have vintage Mono-Red deck sleeved up IRL. I'm just looking for another option and to use my beta forks. Also isn't 16 lands, power, 10ish creatures just inevitably U/R delver? @john-cox it can be, but it can also be burn. Burn doesnt play many generic mana, so I guess it can be lotus and ruby and blue power. Burn without attacking creatures is too risky. You would need 6 or 5 burn spells to resolve, which takes lots of time. By far the best feeling when playing burn was getting a Dark Confidant into play, so if I were to try to push the deck further I would start from there.